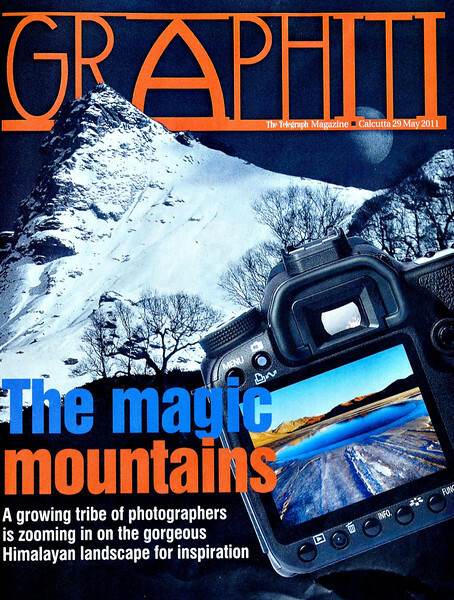 The Telegraph, Calcutta, May 29th 2011 Cover Story on five mountain photographers. For photographer Sankar Sridhar it all began after an arduous trek to Gochala in west Sikkim in 1994 at the age of 16. He was hooked instantly and he returned soon afterwards to climb two 21,000-ft peaks in Ladakh and to take photographs along the way. Over the last few years, he’s criss-crossed the state, travelling there about 54 times. He has already turned out a book on Ladakh and he’s currently working on two more books — one on its lakes in winter and another on the Gaddi tribes of Himachal Pradesh. Or take a look at Mumbai-based climber-photographer couple Vineeta and Divyesh Muni who’ve been trekking and clicking pictures ever since they were teenagers. In 1985, Divyesh (at the age of 19) climbed Mt Kamet, and in 1997 Vineeta along with eight other women did a rigorous 4,500km trek from Arunachal Pradesh to the Karakoram Pass that took over seven months. The couple’s photographic journeys were on display till recently at a show called Himalayan Mystic at Mumbai’s NCPA. “Our photography is spontaneous,” says Vineeta, who insists that they are mountaineers first and photographers only second. The Munis are planning another photographic-expedition to Ladakh in August. Sridhar and the Munis are part of the growing tribe of photographers who are turning their lens on the Himalayan landscape and capturing the jagged peaks and distinct lifestyle of the region. They are leading expeditions into the higher reaches of the Himalayas, holding photo exhibitions and putting together lavishly produced books. Cut to Rahul Sud, 39, from Kullu who’s been photographing the region for 10 years now. Initially, he concentrated on the tree-line areas (below 9,000ft). Then, he shifted focus to higher altitude regions (abo-ve 10,000ft). Some years ago Sud held his first exhibition at the Roerich Art Gallery in Manali and more recently he published his first coffee-table book Kullu — Beyond Horizons. “The idea was to embark on a photographic journey to capture uncharted routes and villages,” he says. In this book, he’s clicked lakes like the Beas Kund (13,000 ft) and the Bhrigu Lake (14,200ft) and scenic spots like the Tirthan Valley with its fast-flowing mountain river. Up next are two more book projects — one on the Great Himalayan National Park and another on the Parvati Valley. In 2001, his coffee-table book Sikkim — A Traveller’s Guide, co-authored by Arundhati Ray, was the finalist at the Banff Mountain Book Competition in the Adventure Travel category. Currently, Das is working on another book on the Indian Himalayas. He’s also set up South Col Expeditions in Calcutta that runs treks and photo workshops in the Himalayas. Most of these photographers go beyond just snapping away with their cameras. For instance, Mumbai-based photographer Atmaram Parab, who’s been to Ladakh 84 times, takes amateur photographers into the mountains. Parab has set up a club, Wanderers, which has 130 members, and also has a photo-tours company, Isha Tours. At a different level, what started as a hobby for Shimla-based Himanshu Khagta is now a vocation. He’s currently shooting in the Churdhar region of Himachal Pradesh. In August, Khagta will be doing a month-long trek to Ladakh. Of course, funding is still a big problem. Most of the expeditions are self-financed by the photographers. Says Divyesh: “The Everest expedition is the most expensive and costs about Rs 25 lakh per person. A trek to any other of the Greater Himalayan peaks will set you back by Rs 3 lakh per head.” So Sud raises money for his treks from his own hotel business and Vineeta is a commercial artist. Divyesh is a practicing chartered accountant. In recent years, Himalayan photographers have discovered a greater demand for their images. So while the Munis recently showcased their work at the NCPA, Das showcased his at various art exhibitions in New Delhi and Calcutta. Sridhar’s photographs too have been exhibited across India and fetched him awards. His photographs of a winter trek across the frozen Zanskar river fetched him the Best Mountain Adventure award at the Banff Mountain Festival in 2009. And these shutterbugs have armed themselves with right qualifications. Sridhar and the Munis have done advanced courses at the Nehru Institute of Mountaineering in Uttarkashi. And Vineeta also did a three-month photography course under Mumbai-based portraitist Beli Homjee. Inevitably, every photographer is trying to develop a unique style. Sridhar’s focus is on the unusual. He says: “Since Ladakh gets minimum snowfall even in the high winters, I once waited for snowfall and was out there at sub-zero temperatures to capture it. Nowadays, I tend to go against the very grain of traditional landscapes to concentrate on fleeting moments in the play of light and shadow.” There’s also Sud who likes to apply radical techniques, like giving the clouds an almost surreal look. He says: “This blurring technique is achieved by using slow shutter speed. This is done by placing a filter in front of the lens to block light.” He also shoots broad panoramas, some even spanning 360 degrees. Though the technicalities of being a Himalayan photographer are easier now thanks to smaller digital cameras, most photographers say the older analogue cameras were better. Says Vineeta: “Some of the best photography has been done with those cameras. But due to the high processing cost, we’ve now switched to digital ones.” So while Das still uses the Nikon F3 HP and the Nikon N90S, Sud uses a Nikon F80 and Sridhar too votes for his earlier Nikon F80 and F100 cameras. There are other challenges too. You must be able to withstand freezing temperatures, be persevering and be able to do lots of walking. Vineeta recalls breaking a few bones while climbing. Sridhar remembers miscalculating the depth of a swollen river in the Kangra Valley and losing his camera bag while crossing it.